Otis took up swimming 3 years ago to save himself from the grief that was drowning him. Now he's training for States, his coach, 18 year-old Dara, pushing an Olympic dream - a dream she gave up when she lost her arm. Otis's summer looks to be full of chlorine and sunburn - until he gets an email from Meg, the girl he hasn't spoken to in 3 years, the girl who helped him tread water after tragedy, the girl who left town. Tragedy cuts deep, and every character in this book has scars - terribly visible or under the surface - and they are beautiful. Paper Towns fans take note, this is your new favorite book. Otis and Meg were inseparable until her family abruptly moved away after the terrible accident that left Otis’s little brother dead and both of their families changed forever. Since then, it’s been three years of radio silence, during which time Otis has become the unlikely protégé of eighteen-year-old Dara—part drill sergeant, part friend—who’s hell-bent on transforming Otis into the Olympic swimmer she can no longer be. But when Otis learns that Meg is coming back to town, he must face some difficult truths about the girl he’s never forgotten and the brother he’s never stopped grieving. As it becomes achingly clear that he and Meg are not the same people they were, Otis must decide what to hold on to and what to leave behind. Quietly affecting, this compulsively readable debut novel captures all the confusion, heartbreak, and fragile hope of three teens struggling to accept profound absences in their lives. Paula Garner lives in Chicago with her family and their psychotic cat. Phantom Limbs is her first novel. This debut novel is a story of loss, love, and friendship, about a teenager coming to terms with the past and dealing with repressed memories that are resurfacing...Readers will find Otis relatable and endearing in his first-person perspective of first love and heartbreak, as well as his unwavering loyalty to his friends. Meg and Dara round out a cast of well-developed characters who have extensive troubles of their own. Most teenagers will find a little bit of themselves in this well-executed work; a must-have for most YA collections. The inability to let go of the past pushes all three white teens beyond their comfort zones into uncharted territory, Garner slowly and steadily guiding readers through these journeys. A heavy read weighted by intense emotions and grief, the novel sifts through tough memories, searching for the silver lining. Otis’ journey—as a competitive swimmer and as a grieving brother—is a poignant one...It’s tough-talking, reckless Dara who will intrigue readers. Her struggles with her father, her sexuality, and the dreams deferred because of her accident complement Otis’ story, elevating this to a narrative as much about human connection as it is about sports. Garner’s debut sensitively portrays Meg and Otis’s bruised emotions, both recovering from deep loss. Though the description of Mason’s accident is a gut-punch in its realism, much of the plot unfolds predictably. The novel’s strongest moments go to Dara, whose no-holds-barred personality—“she was the human equivalent of a Venus flytrap”—livens and complicates the novel. Otis is a refreshingly authentic male protagonist who will win readers over . . . [A]n uplifting story about resilience and the power of relationships. In her debut novel, Garner examines the depths of loss and despair. Ultimately, Dara and Otis and Meg come to realize that hope, though fragile, is present in celebration of the simple things in life...the subtle and nuanced character development and the slow realization of how loss must be confronted create a believable and compelling read. Like most good summer reads, Phantom Limbs by Paula Garner is a delicious slow burn...Garner’s depiction of teenage sexuality is spot on, but even more so is the way she captures and crystallizes a very specific teenage experience. Tragedy cuts deep, and every character in this book has scars—some terribly visible and others under the surface—but they are all beautiful. Paper Towns fans take note, this will be your new favorite book. The nuanced way that Garner deals with loss is not only beautifully done, but it’s thoughtful and insightful. 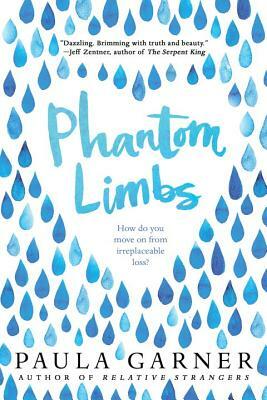 Phantom Limbs is a quietly affecting, well-written gem of a book that will resonate with readers, long after the last page has been reached. A definite YA standout for 2016.